Low noise, high output amplifier well suited for small channel capacity CATV amplification where slope adjustment is needed. All of these Amplifiers will Pass VHF/UHF, FM, HDTV, DTV and Analog Signals. If the Amplifier has a Start Frequency of between 50 and 54 MHz, and a Stop Frequency of up to 1000 MHz (1 GHz), then they are good for amplifying Off-Air TV or Forward Cable TV Signals for distribution around the Home, Apartment Complex, Hotel or Motel. If the Amplifier is 2-way capable, or is "Return Passive", then it passes the 5-42 MHz. Return Band (in Addition to Amplifying the Forward Band) utilized by the Cable TV System for 2-way communication with your High Speed Internet Modem, Pay Per View Subscriber Terminal or Digital TV Converter Box. 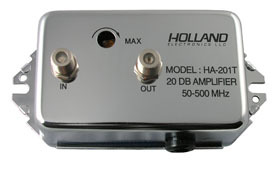 If the Amplifier has a Start Frequency of between 50 and 54 MHz, and a Stop Frequency of up to 2150 MHz (2.2 GHz), this means that the Amplifier is Wide Band (Satellite mixed with Off Air Antenna TV or Cable TV) and will also Boost Satellite Signals in addition to the TV antenna Signal or Cable TV feed. If the Start Frequency is around 950 MHz, and a Stop Frequency of up to 2150 MHz (2.2 GHz), then they are Solely for Satellite Signal Carriage, as this is the Frequency Range (or Bandwidth) Satellite TV Dish signals typically operate in. An Amplifier doesn't give you anything more than what you already had. If you had good Signal level coming into your system and are losing it through excessive cable or splitter loss, then you should back up and an amplifier should be placed in the system ahead of this loss, as to pre-emphasize it as to counteract the loss and come out even Steven at the other end. If you've already lost good signal, placing the amplifier at that point in the system will only amplifier the bad signal, and more than likely, make it worse. The New Digital Signals in Cable TV Systems (and Off Air) are typically -12 dB (less) in peak amplitude than when compared to their Analog counterparts. They have the same Power, and carry more Data, it's just that the Duty Cycle and Modulation rate is always higher on the Digital Carrier. Where as the Analog Signals have just about a 1 to 1 ratio between Carrier to Noise and the Signal to Noise Ratios (meaning that more signal Level increased the Quality of the Picture), the Digital Carrier is Packed with the predetermined Resolution and Quality of the Signal at the source, and a long as it arrives at the Receiver above the Dynamic Threshold (and without Interference) it will yield the Picture as intended from the Programming source. Though a HDTV Receiver or TV set can accept lower levels and yield the desired result doesn't mean that this lower limit should be depended on. The FCC required analog input levels of 0 dBmv into a TV set, Modems and HDTV sets can operate down into the negatives, but again, I wouldn't accept that as business as usual. Unfortunately, a lot of Systems out there were never fully prep'ed to handle the outer Bandwidthes of the increased Channel Capacities and Line-Ups before they started cramming digital carriers on them. As Most Cable TV Companies still use Analog carriers at the Low and High end of the Carriage Spectrum for Monitoring and AGC/ASC Circuits, just ask your Cable TV Technician to check them and tell you what the levels are coming into your Home, Office or MATV/SMATV Distribution System. Neither High or Low should be below +10 dBmv at the Demarcation point (the little Gray box or Ground Block). If it is, tell them they got some work to do. If you have good Signal Level and Picture Quality at the Hand-off point, then you should be able to maintain that with Quality cable, connectors, splitters and amplifiers placed at the proper locations to anticipate and off-set the loss ahead of time. The Gain or "Boost" of an Amplifier is Rated in dB (decibel) and really should be selected on the Signal Loss of the System that they are Intended for use with... In other words, Total the loss of the Cable and Passives (Splitters) that are in line to the Location that You need extra Signal to, and select an Amplifier whose Gain comes close to matching the Loss you are Desirous of Overcoming. Bigger is NOT always Better (You don't want to much Gain as it may Lead to Distortion), and ALWAYS check your Connections and Splitters for Problems or Faults that may be the Source of Your Problems First, before automatically assuming you need an Amplifier.